Thread: New Tank.. but what kind?!?! So my aunt just gave us a old tank of hers today.. 75 Gallon (i believe if not larger) Hexagon with stand. it hasnt been set up in like 15 years, but has been kept out of the cold, and not in the heat. We wouldn't be setting it up till spring to test for leaks.. but here's my dilemma..
What can i/do i want to put in it?! It was originally fresh water, then was converted into salt water.. broken down and now sitting of years. Once i give it a good clean out can it go back to tropical should we choose to? Right now i have a 20 gallon fresh tropical that needs to be overhauled with new plants, And a 55 gallon Diadema Acara tank. Weve done cichlids before and it wasnt as fun as i thought it was going to be.. So im thinking now maybe salty tank? Or another large tropical with larger species. What do you guys think?? What would YOU put in it? 55 Gallon - Raphael Catfish, Spotted Pleco, Getting ready to restock with angels. 20 Gallon- Community tank, Neons, Orange platties, bristlenose plec, clown plecos. I have never done salt water, but if I remember correctly, it is more expensive and possibly more upkeep. I would go for fresh and the type of upkeep I am used to for now, since you have other life events coming your direction (if I remember that right too....). 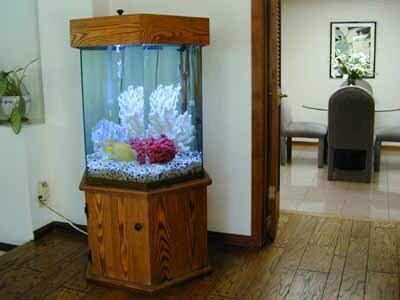 Maybe just a few, larger fish than fit in your smaller tanks so it is different? I have just kidnapped myself! I need $1,000,000 or you will never see me again. Thanks! We were thinking Blue Acara, some Bosemani rainbow, rainbow shark, Green or maybe gold Severum and maybe earth eater or Syndotis catfish of some kind. Weve kept cichlids in the past, and fresh small tropicals since i was little and i have my Acaras now, but we want some larger species. My Diadema arent all that big. I have them in my 55 gallon tank with my raphael catfish and thats it. Might try and add some dither but unsure if they are going to bother them since they have been alone in the tank for so long. We are heading to Zoo Creatures tomorrow as they have some of the ones we want in stock. Anyone have experience with keeping Blue Acaras and what other species i can keep with them?? The bosemani would be a good idea to add to the blue acara as both species prefer hard water. I'd think carefully about the rainbow shark though as these tend to be very territorial. I thought it was only the red tails that were territorial? Are they both?? From experience, the rainbow shark is also territorial. I had one that annexed half or my four footer and chased the clown loaches away unless they were all there. There's not much that can be done about the territoriality, other than using plenty of décor to break up lines of sight. Without that all of the fish end up being stressed - the rainbow shark by constantly trying to defend its territory and the other fish by being harassed when they trespass. Ahh understandable. Well we will keep away from the sharks then. Do you have any recommendations for something else to add to the tank then? First question would be to check if you're in a hard, soft or neutral water area. Try marine. It's very, very, very hard work. But very, very, very worth it. Start with fish only or maybe some crabs/shrimps also. Edit: TFC may be alive but does anyone actually read these posts ATM? Last edited by Interzone; 05-02-2014 at 08:55 PM. The forum has been very slow since it kicked off again, but with the e-mails going out it may pick up again soon. I haven't seen her post since it kicked off again. Though I am still in contact with her through Facebook and she still has the menagerie on the go, including I believe 6 tanks.